To be in with a chance of winning, all you need to do is follow the instructions at the bottom of this page. 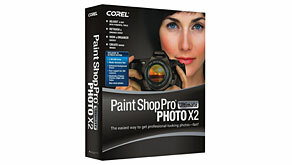 We have a copy of Corel Paint Shop Pro Photo X2 Ultimate to give away during December. Paint Shop Pro is a powerful image editing package, with RAW file processing support for all the most popular RAW-capable cameras. X2 Ultimate is also the latest in a long line of Paint Shop Pro developments since it was originally launched in 1992. X2 Ultimate offers improved RAW support, and background remover plug-in, a new creative content pack, a fun Corel Painter Photo Essentials program, bonus media recovery software and a bonus 2GB USB flash memory drive. Corel� Painter� Photo Essentials 4, PHOTORECOVERY� media recovery software, Corel� MediaOne� Plus, all-new creative content, a detailed Background Remover plug-in plus a free 2GB USB flash drive. Paint Shop Pro Photo X2 Ultimate has everything you need to harness the power of professional-quality photo-editing. Don�t miss your chance to win � Entering this month's prize draw is easy! To be entered into the draw for a chance to win a copy of Corel Paint Shop Pro Photo X2 all you need to do is to subscribe to our email newsletter, Four Thirds User, which keeps you up-to-date with what's new FTU-wise. Already a Four Thirds User newsletter subscriber? You aren't excluded! If you are already one of our thousands of subscribers, you can enter too � just follow the instructions on the entry form. Good luck!